As I think I have mentioned before on this blog, I have a strong affinity with beers with a real ceramic top. 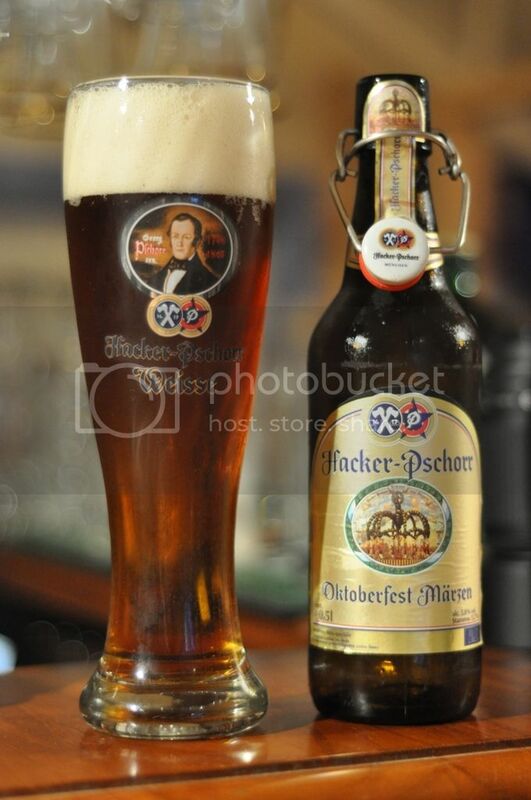 Hacker-Pschorr is one of the few breweries that still use real ceramic tops and is also one of the 6 beers able to be served at Oktoberfest as it is brewed within the Munich city walls. The Hacker-Pschorr Brewery was established in 1417, 99 years before the enactment of the Reinheitsgebot. The brewery is famous for their weisse beers and they also claim to be using almost an unchanged brewing process for the last 580 years. This is one of the few Oktoberfest beers that can legitimately call itself a Marzen, as this brewing for this particular beer is always begun in March, and finishes not long before the start of the festival. Hacker-Pschorr Oktoberfest has a lovely dark copper colour, this is much more in accordance with a traditional Oktoberfest beer than the previous two beers reviewed. The head is massive, 3-4 fingers at least of slightly off white head, however this head is well aerated and disipates relatively quickly. There is medium-high levels of carbonation present and this helps the beer lace the glass very nicely. This is very close to the perfect example of an Oktoberfest beer. Sweet bready malts dominate the nose of this beer early on. There are some earthy hops also present, I'm not quite sure on which variety they are but they smell nice an bitter. I also get a hint of spices, mostly nutmeg. This gives it almost the feel of a Christmas Ale, but with a more bitter feel to it. The malts really are the star of the show here though, they smell sweet and appealing and with any luck they will also taste good. This beer tastes spectacular! Although it's not the dominant flavour, the first thing that jumps out at me is the ammount of spices I can taste in this beer. There are nice slightly sweet bready malts first up but they have a nutmeg flavour over the top, this flavour is very unusual but very pleasing. The hops are not overly bitter but are there to provide this beer with some balance. The carbonation is not so high that it makes the beer hard to drink, infact it's very very easy to drink. I really love this beer! The flavours are excellent and it's incredibly drinkable, I've had the two that I had here and I'm craving more! I could honestly see myself sitting at Oktoberfest drinking nothing but this, it really is an excellent beer. It's quite hard to get here in Australia but if you are interested Dan's have a 4-pack of Oktoberfest beers, which this is included in or you can order them from the International Beer Store in Perth. If you are interested drop me an email or a comment and I'll split the shipping with you.